Canada home healthcare market represents a wide range of home medical devices and services to support patients with chronic disease conditions. The risk and prevalence of chronic and lifestyle related diseases are constantly increasing in Canada which would drive the acceptance of home medical devices and services, consequently leading to the growth of the market. Moreover, changing demographics in Canada further supports the growth of Canada home healthcare market. Statistics Canada projected that around 5 million people in Canada were aged over 60– 65 years in 2011 and the number is expected to double in the next 25 years (10.4 million). Such change in demographics will shift a substantial portion of population to the higher risk level for illnesses that demand continuous medical intervention. Thus, this factor would in turn increase the utilization of home healthcare devices and services hence driving the market growth. Moreover, advancement in technologies, increasing sedentary lifestyle and growing preference for alternatives to hospital based long-term care also supports the Canada home healthcare market growth. However, high costs coupled with strict regulatory environment restraints the market growth. The Canada home healthcare market is estimated to be USD 10,449.1 million in 2013 and is expected to reach USD 18,939.9 million by 2020, growing at a CAGR of 8.9% from 2014 to 2020. The Canada home healthcare market has been studied from three perspectives: by device types, by services and by provinces. 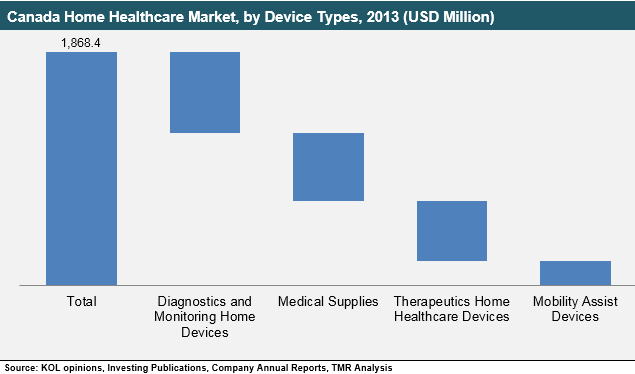 Based on device types, the market has been segmented into four categories: diagnostic and monitoring devices, therapeutic home healthcare devices, home mobility assist devices and medical supplies. Among these, diagnostics and monitoring devices are accounted for the largest market, capturing over 30% of the total Canada home medical devices market in 2013. Efforts of the Canadian government to increase awareness about hypertension, diabetes and sleep apnea management through home monitoring drives the growth of diagnostics and monitoring devices segment. Moreover, home mobility assist devices market segment recorded the lowest revenue in 2013 owing to the low cost of market constituents such as cranes and crutches, walkers and rollators and others. Based on services, the Canada home healthcare market is categorized into rehabilitation, telehealth and telemedicine, respiratory therapy, infusion therapy and unskilled home healthcare services. In 2013, unskilled home healthcare services market accounted for the largest market and is expected to dominate the market in future. Growing geriatric population coupled with increasing uptake of nonprofessional home care services in Canada helps this segment to grow consistently during the forecast period. Moreover, telehealth and telemedicine services only accounted for 2% revenue of the total home healthcare services market in 2013 but is expected to grow with the highest CAGR of around 11% during the forecast period from 2014 to 2020. Fundamental benefits availed from these services such as high cost-effectiveness, quality health care and access to health care services throughout rural and urban areas supports the growth of the market in Canada. In terms of geographic distribution, the Canada home healthcare market has been segmented into four provinces i.e. Ontario, Quebec, Alberta and Rest of Canada. The Ontario home healthcare market in 2013 accounted for the largest market share due to high demand for home healthcare devices and services. Moreover, consistent rise in geriatric population and favorable government policies propels the growth of home healthcare market in Ontario. Followed by Ontario, Rest of Canada turned out to be the second largest market due to increasing number of obese population over the last few years. The Canada home healthcare market in Quebec is expected to grow at the highest CAGR of 9.2% from 2014 to 2020. The growth of this province is mainly attributed to the large population base and increasing incidence rate of chronic diseases. The Canada home healthcare market is fragmented in nature, having presence of large number of small scale and large scale home medical device and services providers. Some of the prominent home healthcare devices and service providers in the Canada home healthcare market are Johnson & Johnson, Omron Healthcare, 3M Healthcare, GM Healthcare, We Care Health Services, The Canadian Home Care Association, Home Care Ontario and others. The home health care market includes a wide range of medical devices and services that are used by patients to treat, diagnose, and monitor a variety of chronic diseases. These devices and services play an important role in providing cost-effective health care to the patients. The home health care market offers lucrative business opportunities in Canada due to increased acceptance of home health care, technological advancements, and cost-effective alternatives compared to other modalities (i.e. hospital visits). Factors such as aging population and increasing number of people diagnosed with chronic diseases such as diabetes, cardiac disorders, and respiratory diseases are driving the growth of the home health care market in Canada. The Public Health Agency of Canada estimated that three individuals out of five in Canada (aged 20 years and above) suffer from chronic diseases such as diabetes, cancer, mental illness, and cardiovascular diseases, and four out of five are at risk of developing chronic conditions. Moreover, several organizations, such as the Commission on Accreditation of Rehabilitation Facilities Canada, offer accreditation programs to the home care service providers to improve their home care business operation and quality of patient care, which in turn would contribute to the growth of the market. Other factors fueling the growth of the home health care market are aging population, rising government spending on home care services, and cost effectiveness However, the high cost of professional health care services and home medical devices is likely to restrain market growth. This report encompasses a detailed study of various home medical devices and home health care services in Canada. Home health care devices have been segmented into diagnostic and monitoring devices, therapeutic devices, home mobility assist devices, and medical supplies. The diagnostic and monitoring devices segment includes blood glucose monitors, blood pressure monitors, sleep apnea monitors, pregnancy test kits, pulse oximeters, heart rate monitors, temperature monitors, pedometers, and coagulation monitors. The therapeutic devices segment comprises insulin delivery devices, nebulizers, ventilators and CPAP devices, IV equipment, and dialysis equipment. The home mobility assist devices segment has been further categorized into wheelchairs, cranes and crutches, and other mobility assist devices. The market size and forecast for each device type has been provided for the period from 2012 to 2020, considering 2013 as the base year. The report also provides the compound annual growth rate (% CAGR) for the forecast period from 2014 to 2020 for each segment. 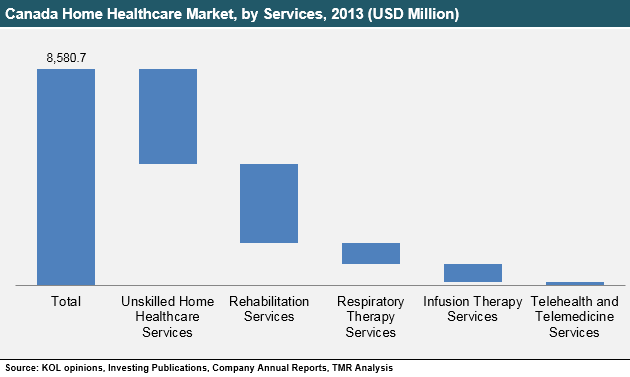 Based on services, the home health care market has been segmented into rehabilitation services, respiratory therapy services, tele-health and telemedicine services, infusion therapy services, and unskilled home health care services. The market size and forecast in terms of USD million for each service has been provided for the period from 2012 to 2020, considering 2013 as the base year. The report also provides the compound annual growth rate (% CAGR) for the forecast period from 2014 to 2020 for each segment. The home health care market in Canada has been segmented into four major regions: Ontario, Quebec, Alberta, and Rest of Canada. The market size and forecast for each province has been estimated for the period from 2012 to 2020 in terms of revenue (USD million), considering 2013 as the base year. The report also provides the compound annual growth rate (CAGR %) during the forecast period from 2014 to 2020 for all the provinces mentioned above. The market overview section of the report discusses the market dynamics with respect to the market drivers, restraints, and opportunities. This section also covers market attractiveness analysis of the home health care market in Canada. A list of recommendations for new players planning to enter the market and for existing players to enhance their market shares is also presented in the report. The report concludes with company profiles of key players operating across various segments of the market. Each company profile includes business overview, financial overview, product portfolio, business strategies, and recent developments. Some of the prominent players in the home health care market in Canada that have been profiled in the report include 3M Health Care, Abbott Laboratories, Inc., Cardinal Health, Inc., Johnson & Johnson, GE Company, Invacare Corporation, and Medtronic, Inc.